My favorite moment from yesterday at the memorial service for former President George H.W. Bush was the chill that descended upon the front row of former presidents and First Ladies when Donald and Melania Trump arrived. Even Fox News' Chris Wallace noted the change in spirit when the Trumps arrived. “I have to say I was struck when President Trump and Melania Trump came to the front row, that it was as if a chill had descended on that front row," Wallace said on Fox's "America's Newsroom" during live coverage of the Bush state funeral at Washington National Cathedral. 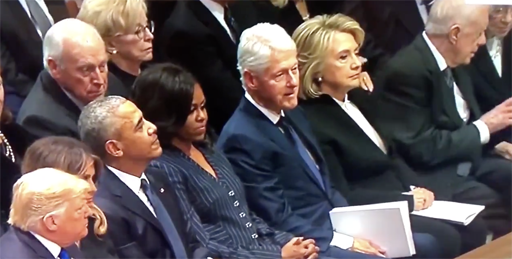 Trump and the first lady greeted the Obamas and shook hands when sitting down next to them in the front row of the service for Bush, who passed away last Friday at the age of 94. There was no greeting between the Trumps and Clintons, who sat farther down the row. I love that Hillary Clinton didn't even glance his way. He's been hideous to her and she owed him nothing.